The “Number One Car” symbolic of the reigning Panoz Racing Series GT champion is flanked by Barry Ellis’ Number One ride—one of his company’s Lears. That’s an interesting observation coming from Ellis, whose journeys to pilot and champion racer (including pro series) were unanticipated. The 43-year-old president and director of operations for Hop-A-Jet Worldwide Jet Charter in his hometown of Ft. Lauderdale was born in Binghamton, N.Y., and lived in the Pittsburgh area before his family settled in Ft. Lauderdale. Ellis was introduced to the world of racing around age 12, competing first in motocross in Pittsburgh and later, fairly successfully, on the regional circuit in Florida. He was good enough to be awarded what’s called a “Yamaha support ride.” That’s when the maker supplies competitors with bikes and equipment for promising riders who’ll race under the brand banner. Ellis was doing well enough that he turned pro for the 1982-1984 seasons, but had to abandon competition due to a crash that left him with crushed vertebrae in his upper back. “It made sense for me to move on,” he says. He stayed with the bikes, though, having begun working at age 16 as a truck driver at the local Yamaha motorcycle dealership. Between racing and the bike shop, he managed to graduate from high school and move on to earn a bachelor’s degree in business administration from Florida Atlantic University in 1986. Working at the store and his education simultaneously, Ellis worked his way through parts and service and sales and became the dealership’s general manager at the age of 23. That’s when fun and fate really began to collide. Ellis and his friends used to take off from Florida to the Bahamas in boats. In an early turn of fate, Ellis was encouraged by the manager of the flight school to get his instructor rating, which he initially opposed. Barry Ellis, seen at the yoke of the Lear, says that only with time in the cockpit, at the wheel of a race car or yoke of a plane, can you expect to master the skill. Fate being what it is, upon completing his check ride for the instructor rating, not only did Ellis get a good recommendation from the FAA inspector, but that recommendation won him a job offer as a flight instructor at the same school where he earned his wings. Reluctant as ever, Ellis initially turned that offer down, too. “I did some soul searching and reflected on the fact that I had spent nearly 14 years in the motorcycle industry and realized I was getting nowhere fast, so I decided to make the career change,” he said. He worked as a flight instructor for two years at CAV-AIR. That turned out to be a fortunate turn of fate also, as the company added a multi-engine plane, a Piper Seminole, to the fleet. That allowed Ellis to get his multi rating and multi-engine instructor rating while working as an instructor in his new-found profession. “I was fortunate enough to have a manager at the flight school that helped me get multi-time while instructing,” he said. He said instructing taught him a lot as a pilot. 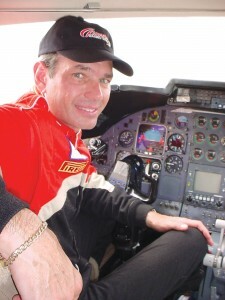 Even today, as the head of an international jet charter service, Ellis is a staunch advocate of hiring people who come to him with instructor experience. In late 1989, at the urging of a friend working at nearby Hop-A-Jet, Ellis went to see the company and its planes and to meet Harvey Hop, founder and president, who began operations in 1976 with a single new Lear 25. “We hit if off, and right then he offered me a job as first officer on the company Learjet 25s and 35s,” Ellis said. Ellis began his career at Hop-A-Jet in early 1990, and was quickly upgraded to first officer and then captain in 1991, of course, flying all over the world shuttling VIPs from the world of business, entertainment and politics and private vacationers. He became chief pilot in 1992, subsequently leaving for the administrative side in 1996, ultimately becoming president and director of operations. Harvey Hop has since passed away, and a group of investors now owns the company. The fleet consists of two Lear 35s, four Lear 55s, three Lear 60s, one Challenger 601 and three Challenger 604s. Ellis is at the helm of a traditional, ad hoc charter company, which also offers wholesale operations for other charter companies and brokers, as well as functioning as a sub-contractor for fractional aircraft providers. Within the past four years, Hop-A-Jet branched out to offer aircraft management, maintenance and interiors through its repair station, South Florida Jet Center. Just like Ellis’ career in the air, his career in race cars was kismet-based. Soon, however, the competitive spirit was renewed and Ellis was hooked again, this time in world-class, high performance GT race cars. His skills and abilities evolved from the Panoz Racing School into the Panoz Racing Series very quickly. He won his very first event. Later that year, he competed at the Sebring event finishing third behind racing veterans Gavin Riches and Audrey Zavodsky. 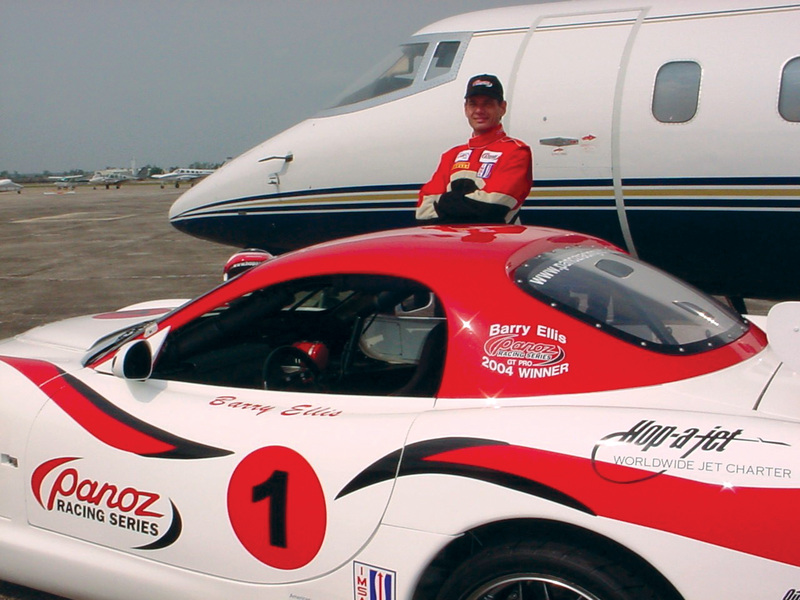 In 2003, Ellis had a plan to do the entire Panoz series, pro and GT. In his first race as a pro, he captured the pole of the 2003 Panoz GT Pro Series at Sebring during the American Le Mans Classic 12 Hours of Sebring week. However, it seemed luck wasn’t with him. “Due to driver error and mechanical issues, I posted a DNF (did not finish),” he said. Barry Ellis’ training as a pilot and instructor has contributed to his success as reigning Panoz Racing Series GT champion. Here, in Car 11, he’s about to make his move at Sebring International Raceway for the season’s first race. Luck aside, Ellis was undeterred. Recognizing the competitive spirit in all pilots to be better and better (in fact, taking the inaugural Panoz race at Virginia International Raceway), he went on to finish consistently better throughout the year, especially in the pro series. He ended the 2003 season with a resounding victory at Petit Le Mans at Road Atlanta where the race was billed as the official support race for the series season finale. He also went on to capture the GT and the overall championships that 2003 season—two out of the three crowns available in the Panoz series. As a pro, he finished fourth in his rookie season. Not bad for his first full year of racing. “My goal for 2004 was to go out and win all three championships—GT, GT Pro and Overall Panoz GT Champion,” he said. It began with a win at Sebring, an astounding mid-season race at Mid Ohio Raceway in which his GT car ran second most of the race to higher horsepower cars, and a strategic second place at the Panoz Petit Le Mans event last Fall. As the Panoz Racing Series championship display car carrying the name of Barry Ellis, Champion, was unveiled, Ellis announced plans to defend his Panoz Racing Series crown and to simultaneously explore additional opportunities with business associates and longtime friends (flyers and Panoz co-competitors, too) Fraser Wellon and Frank Rossi in other high-level professional series this year. 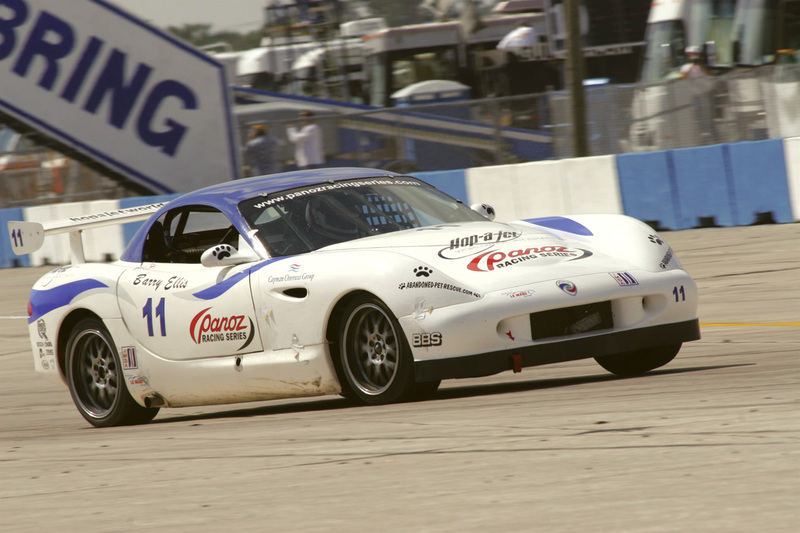 So far in 2005, Ellis has competed at the Panoz season opener at Sebring taking second at his home track, and competed in another series in the Dominican Republic and at Daytona. Ellis is very upfront about what he’s learned from his instructors, the world-class racers who teach at the Panoz Racing School, and gives a lot of credit to his racing instructors. “I learned that if I listened to my instructors, anything is possible,” he said. That may include a run in the near future in a full-blown American Le Mans Series international event, Ellis has admitted privately. Just as he knows that he’s a better pilot because he’s an instructor, Ellis knows too that becoming a racing instructor would allow him to be a better driver himself. Would he? Absolutely, if the situation presented itself. In the final analysis, Ellis says the biggest commonality between flying and racing is the benefit you get from experience.